You see, I have the following problem, to see if you can help me please. It turns out that I had some problem with ES and decided to update from the EmulationStation source. Up there very well, no problem! When updating ES, the option "openlec" appeared in the start menu, and since I did not know what it was, I pressed it, to try ... 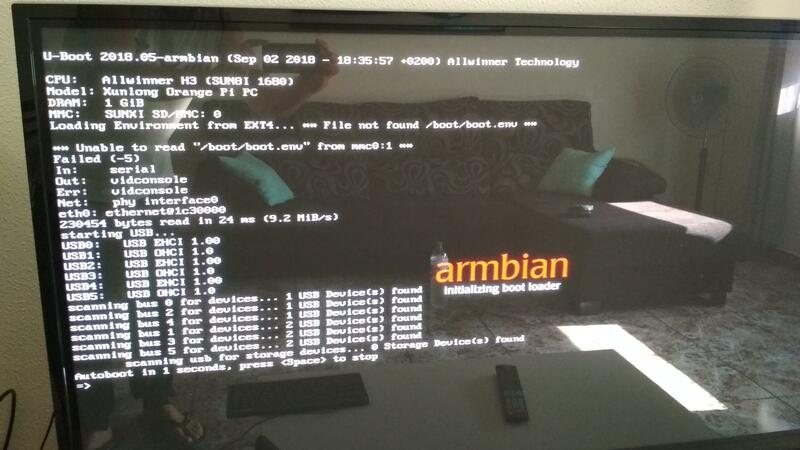 The result has been that the boot has been corrupted, it seems that there is a failure in the boot , and the system does not start ... Attachment screenshot of the error. Please look if you can help me, thanks !!! data: orange pi pc, retrorangepi 4.2 full. Yes, there is no Openelec for v4.2 so bootloader is not working anymore. This can be fixed by copying boot.scr to the boot folder (ext4 access is required). (09-23-2018, 02:35 PM)alexkidd Wrote: Yes, there is no Openelec for v4.2 so bootloader is not working anymore. Any more ideas before formatting the sd and installing it all again ?? I copied another instance of boot.scr to http://www.retrorangepi.download/boot.scr , from a working v4.2 install. Also added http://www.retrorangepi.download/script.bin (OPiPC default HDMI). Make sure they're being copied correctly, there are 3rd apps in Windows (like Paragon), you have to unmount the sdcard afterwards otherwise it wont copy. (09-24-2018, 01:01 PM)alexkidd Wrote: I copied another instance of boot.scr to http://www.retrorangepi.download/boot.scr , from a working v4.2 install. Also added http://www.retrorangepi.download/script.bin (OPiPC default HDMI). Finally I fix the system boot. But I could not properly run any ext4 application for windows. To be able to put the files that you passed to the boot folder of my system, I had to do it from the same ubuntu, and also, opening its file browser as root. For this, I installed ubuntu in a boot usb, and it worked perfectly for me. * Finally, would it be possible to remove the "openlec" option from the emulation station menu? Could it be eliminated by tagging some file from the system? Is it possible to compile emulation station to leave it as it was before updating it from the source, that is, without the openlec start option? This way I will avoid possible accidents in the future. Yes, gonna fix this as soon as I return from vacation. Apologies for the mistake. I went to the compiler code, but once finished, the dangerous "openelec" option appears in the start menu. In case you want me to try again, just in case I did not change the code correctly, you can directly pass me the emulationstation.sh file and replace it with mine. ok, when I get home I try. Knowing that you have done it and it has worked for you, it is possible that I have done something wrong ... thank you!